NEWLY engaged Martina Hingis has vowed she will not follow tennis contemporaries Kim Clijsters and Lindsay Davenport into retirement and her priority remains a strong year in 2007 to back up her successful comeback season. Hingis, top seed for the Mondial Australian Women's Hardcourt titles starting at the Gold Coast tomorrow, said she had not changed her views on the longevity of her tennis career after becoming engaged to Czech player Radek Stepanek last month. Davenport, 30, disclosed earlier this month she has no plans to play tennis again when announcing she is expecting her first child in May. Another of Hingis's great career foils, 23-year-old Clijsters, has flagged her intention to retire at the end of the year because of her susceptibility to injury and she plans to marry American basketball player Brian Lynch in July. But Hingis, saying happiness in her private life will lead to success on the court, insists she will be on the tour for as long as she is competitive. The Courier-Mail revealed on Thursday that Hingis, 26, and Stepanek, 28, had become engaged at the end of a year in which Switzerland's three-time Australian Open champion had ended a three-year absence from tennis to attain a world ranking of No. 7. "The priorities right now are tennis. There's plenty of time to think about life after tennis," Hingis said. "I'll try to keep up with the young girls and play at the highest level. if it's not the case any more or I don't want to do it, I'll think about it. "I'm happy and I was surprised when it (engagement ring) was spotted right away here. I've been walking around (in Switzerland) for a month and no one noticed. People here must pay more attention to things. "If you're happy in your private life, you are going to do well. You know what you want and I think I'm at that stage right now." 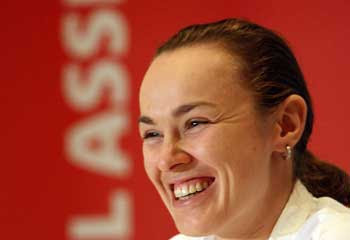 Hingis, who became the youngest Australian Open champion at the age of 16, 10 years ago, spoke excitedly of her appreciation of life outside tennis – a far cry from her bitter public spats over tennis with the Williams sisters and Anna Kournikova before her departure from tennis because of foot injuries. But she retains an unmistakable ambition to do justice to her skills and innate knowledge of tennis. The former world No. 1 had no ranking when she made her WTA Tour comeback at Royal Pines resort 12 months ago, making the semi-finals before reaching the quarter-finals at the Australian Open two weeks later. "I didn't set any goals last year and I won't do that this year," she said.